An awesome dress up game from Rin and Pichi, here we have the perfect tool to recreate characters surviving in a post apocalyptic world. It is particularly good for tackling the zombie apocalyptic and The Walking Dead characters, but it's also great for post fallout, alien take over, or climate disaster. 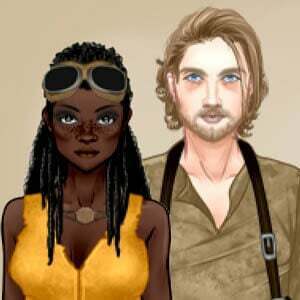 Dress up a boy and girl character who might be a couple, or just comrades in survival. Choose from torn, grimy clothes, weapons, holsters, boots and more. There is a rad selection of hairstyles of various textures, and there are more scars than you can shake a stick at. Accessorize with goggles, gas masks and chainsaws. it's a cool game, but i wish you could remove the underwear/it disappeared when you chose a bottom or that it was smaller! The only thing that would make this better if there were more outwear options for layering.